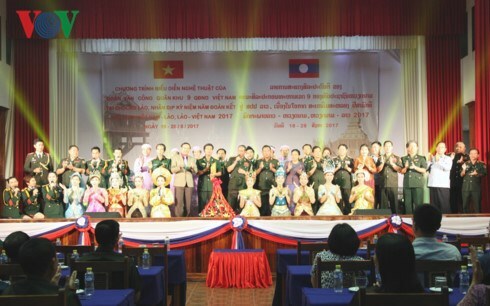 Vientiane (VNA) – An art troupe from Vietnam’s Military Zone 9 had a friendly music exchange on August 26 at Laos’ Ministry of Defence in the capital city of Vientiane, celebrating the “Vietnam-Laos Solidarity and Friendship Year 2017”. Speaking at the event, Lieutenant General Saisamon Salapxeng, head of the Lao Defence Ministry’s Department for Popularisarion and Training, highly valued the musical event, stressing that music exchange is an effective bridge between the two countries. He added that the “Vietnam-Laos Solidarity and Friendship Year 2017” helps Lao soldiers and people understand better about the special solidarity with Vietnam as well as their roles and responsibilities for preservation and development of the two countries’ relations. For his part, Head of the Vietnamese Military Zone 9 ensemble Doan Thanh Xuan expressed his happiness to perform in Laos, saying music will connect cultures, thus promoting friendship and solidarity between the two countries.